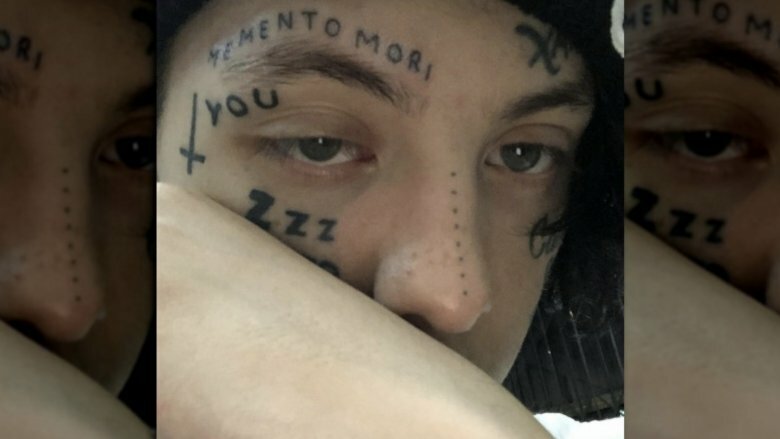 "Wake Up" rapper Lil Xan just got some fresh ink to honor the late artist Mac Miller. On Sunday, Sept. 9, 2018, Xan shared a photo of himself on Instagram, showing off his new face tattoo to his 4.9 million followers. In the close-up picture of his face, Xan, whose real name is Diego Leanos, revealed that his latest tattoo reads, "Memento mori," and it's featured above his right eyebrow. The term is Latin for "Remember you must die," and is meant to remind people of their own mortality. "MOMENTO MORI," Xan wrote in the post's caption, misspelling his tattoo. Alongside a broken heart emoji, Xan continued, "Miss you Mac," adding, "y'all can start hating me now." It'd appear that Xan got the tattoo to honor rapper Mac Miller, who passed away of a suspected drug overdose on Sept. 7, 2018. Miller was just 26 years old. Remarking on Miller's untimely death, Xan told the Adam22 podcast that Miller's passing had greatly affected him and had made him want to leave the music industry behind forever. "The Mac s*** is crazy," he said. "I've been crying in my apartment, Mac didn't die, Mac didn't overdose." Xan, who's been making headlines in recent weeks for his breakup with singer Noah Cyrus, shared, "When your hero dies, f*** that s***, I don't want to make music no more." Xan's new "memento mori" ink is hardly the young star's first. His face also bears his mother's name "Candy" on his left cheek and the word "Lover" on his right cheek. But that's not even the half of his tattoos. However, his tattooed tribute to Miller has caused Xan to receive some backlash from his fans, as noted by People magazine. But many don't seem to be upset with his specific choice of tattoo. Rather, according to his Instagram post's comments, it seems that many people aren't happy with his decision to continue tattooing his face. Xan isn't letting mean comments get him down though. 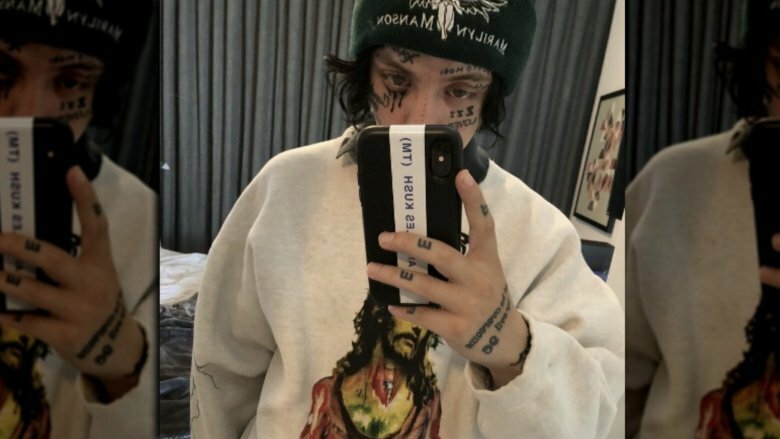 In an Instagram post published the following day, Xan shared a mirror selfie, debuting yet another face tattoo — this one of black tears beneath his left eye. "I do this for me," Xan wrote in the picture's caption. "I could care less if this makes me ugly because that's what I was going for." He went on, "Ugly is the new Beautiful, well not really but there's some truth to that, I love you guys." As noted by XXL magazine, Xan continued to open up on his Instagram Story after posting the photo of his latest tattoo. "I know I'm ugly I get it," he said. "My manager hates me lol." 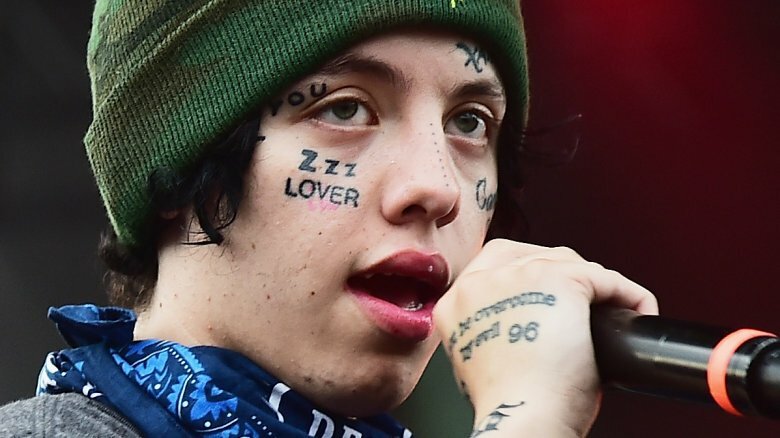 Xan also informed his followers of the tattoo's inspiration, saying that he was influenced by both Swedish rapper Yung Lean and the iconic 1971 film A Clockwork Orange. Mac Miller isn't the first artist who has passed away that Xan has paid tribute to with a face tattoo. In July 2018, Xan got a line of dots inked onto his nose in honor of the late rapper XXXTentacion (real name Jahseh Onfroy), who died after being shot in an apparent robbery in June 2018. "New Tattoo inspired by PRINCE X ! LEGENDS NEVER DIE AND ENERGY LIVES FOREVER," Xan wrote in a caption debuting his new tattoo on social media (via XXL magazine). "REST IN PEACE TO X PEEP AND EVERYONE THATS AFTER." Lil Peep, whose real name was Gustav Åhr, was another rapper who passed away in recent years. As Nicki Swift previously reported, Peep died of a drug overdose in November 2017. Lil Xan has previously spoken out about how his manager had attempted to ban him from getting any more face tattoos, telling DJ Smallz, "I have plans [to get more on my] chest and arms, but the face, my manager says I can't get anymore. I have to keep the face intact." But obviously Xan didn't take his manager's rule too seriously, considering his recent tattoo additions.